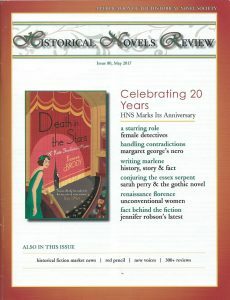 This week I am flying the flag for the 20th anniversary for the Historical Novel Society and its quarterly Historical Novels Review. It was founded in 1997 by historical novel enthusiast, Richard Lee. Membership requests flooded in from dozens of historical novelists who were desperate to have their books reviewed (something well-nigh impossible unless you were either ‘literary’ or already a best seller), and dozens of enthusiastic readers who wanted to review them. I came into both categories. 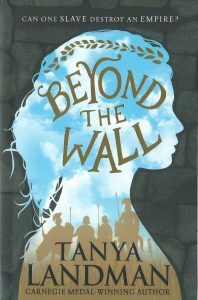 I’ve loved historical novels ever since I was a child and I read voraciously, and by 1997, I had had six historical novels of my own published, but reviews were thin on the ground. I joined the HNS immediately and jumped at the chance to review. It was something I’d always wanted to do. 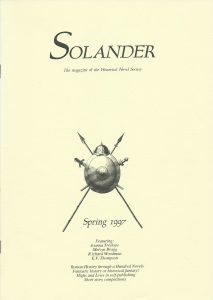 The society also publishes articles, initially in a separate magazine, Solander, the very first of which included articles by Joanna Trollope, Melvyn Bragg, Richard Woodman and E. V. Thompson – not bad for an opening salvo! I have been the UK Children’s/YA Book Reviews editor since 2012, an interesting job and one I’ve enjoyed. I have been struck by how different periods come into fashion as the setting for a novel and then disappear. In 2014, inevitably, the First World War was a popular background. 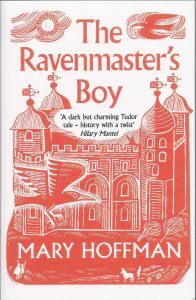 Then there was a long run on the Tudors: Jane Seymour, Lady Jane Grey, Shakespeare’s Globe (several), the Tower of London (see Mary Hoffman’s terrific The Ravenmaster’s Boy above), young boy spies working for Walsingham, etc. 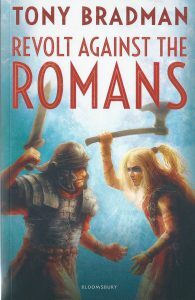 More Roman books arrived, including Revolt against the Romans by Tony Bradman, ‘I’ve fought every kind of barbarian but the Britons are by far the worst’, Marcus is told. His stern father arranges for him to go to Britain but things go badly wrong. Marcus’s party is ambushed and he finds himself a hostage of the savage Catuvellauni and their leader, the fearsome Caradoc. What I like about this book is how Marcus’s view of British ‘savages’ gradually changes. He learns new ways of looking at the world and makes friends, for the first time in his life. A clash of cultures is always interesting, and I’m delighted to see that the author has dedicated his book to the memory of the wonderful Rosemary Sutcliff who also relished such situations. 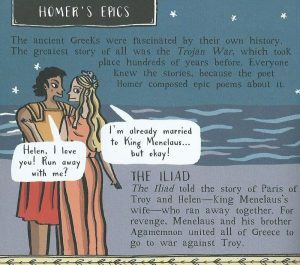 I love the Greenbergs’ historical Discover series; The Ancient Greeks is a lively, intelligent comic strip history of Ancient Greece, including the rise of the City State, philosophy, Greek society, famous people, the Greek gods, Homer’s epics, various myths, and Greek theatre. It is clear, witty, and there is an excellent timeline and a map at the end. It’s also witty. I love the knowing look in Helen’s eye as she accepts Paris’s invitation to elope to Troy. The book is not exactly fiction but, as editor, I can include what I like! 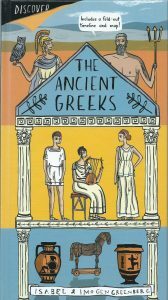 I felt that The Ancient Greeks deserved a review because it illuminates Greek culture brilliantly and enhances the reader’s enjoyment of novels set in that period. Anglo-Saxon is another popular period this quarter. 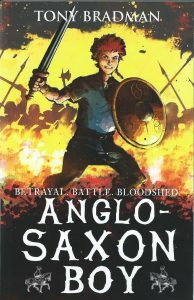 Tony Bradman’s Anglo-Saxon Boy is about the Battle of Hastings, seen through the eyes of Magnus, son of Harold Godwinson, our last Anglo-Saxon king. Magnus really existed, though little is known about him, which, from a writer’s point of view, makes him an excellent candidate as a hero. You can do what you like with him, so long as it’s plausible. 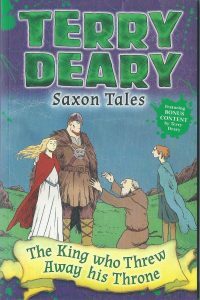 Books by Terry Deary are always popular for younger children. And he has just published four Saxon Tales. The King who Threw Away his Throne is set in 5th century Britain and is about King Vortigern – who may or may not have existed. The Dictionary of National Biography names him as the king who invited the Germanic chieftains, Hengist and Horsa, to Britain to help fight the Scots and the Saxons – with the inevitable result. However, in spite of the story being in Bede’s History and in the Anglo-Saxon Chronicle, modern scholarship suggests that all three of them are more mythic than real. Still, what the hell. A foolish king, invading Saxon warriors on the make, and a sharp-witted cook’s boy all make for a great story. Interestingly, this quarter, most of the books are aimed at young boys and there are no Y/A novels. Doubtless, the November 2017 issue will be different again. Fascinating reading. What a great job you have with reviewing these books! And these are only a selection, Elizabeth. Fortunately, I have stable of reviewers who help.